B&W announces new home cinema speakers | What Hi-Fi? 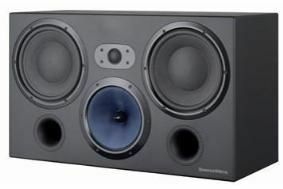 All three speakers can be used as centre, left, right or rear channels, flexible as they are. The flagship model is the CT7.3 LCRS, which features a Nautilus tube-loaded tweeter - as do all three - and is partnered with a 6in Kevlar FST midrange driver and two 8in bass drivers. Next in line is the CT7.4 LCRS, which features two 6.5in Kevlar bass/mid drivers. Last but not least is the CT7.5 LCRS, which offers the same tweeter but with just a single 7in bass/mid driver. Instead of the usual yellow drive units, here all the drives are dyed blue to make them more discrete. Prices are yet to be confirmed, but our sources tell us they will start at around £500 for the '7.5 and up to £1200 for the '7.3.